The School of Public Policy and Administration (SPPA) held its second Municipalities of the Future symposium on March 7. The key themes of the event were partnerships and turbulence. Turbulence – because of the variety of economic, technological, demographic and political disruptions that challenge municipal governments. Partnerships – because of the growing recognition that many problems require interdisciplinary solutions, developed and implemented through stakeholder engagement and cross-sectoral partnerships. 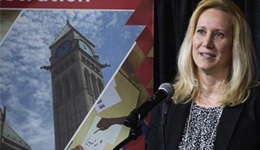 This year’s event featured Kim Delahunt, vice-president, Health System Strategy, Integration and Planning for the Central West Local Health Integration Network (LHIN) as the keynote speaker. In her opening remarks, Professor Alena Kimakova, SPPA director, outlined how the Central West LHIN and Peel Region captured the school’s attention because of their innovative approaches to elder and dementia care and their mental health programs for youth in local schools. Against the backdrop of pending provincial health care reorganization plans and budgetary pressures, Delahunt drew attention to the challenges that the Central West LHIN faces, including the highest prevalence of diabetes, overweight and obesity in Ontario, chronic conditions in 38 per cent of the population aged 12 or older, as well as an anticipated population growth by 2026 of 20 per cent in general with a 61 per cent increase in seniors. With all of this contributing to high and growing demand for health care services, Delahunt highlighted the importance of a strategy focusing on prevention through transformative partnerships with health care providers, municipalities, schools, faith-based organizations, workplaces, community and recreation facilities and functional collaborations involving communication, space planning, capital projects, zoning and corporate partnerships. Public-private partnerships, emerging new models and what these models have to offer to municipalities facing a variety of risks and budgetary pressures also dominated the transit infrastructure panel. The panel on economic development brought into the spotlight how changing economic realities, technological disruption and growing inequality are affecting the fiscal outlook for municipalities both in terms of their limited taxable capacity and the demand for municipal services, the digital divide and new governance issues related to digital data collection. The panel also featured new approaches to addressing reconciliation and entrenched inequities affecting indigenous populations in urban settings. The day concluded with a networking session and a panel on human resources in the municipal context with special reference to demographic changes, strategic planning, succession planning and creating a culture of accountability. The Institute of Public Administration of Canada Toronto Regional Group (IPAC TRG) co-sponsored the symposium for a second year. The majority of the symposium participants were municipal and NGO employees, and our students greatly benefited from all the interactions the event had to offer.